Last week was Thanksgiving – and if you ask any runner what he or she is thankful for, the ability to run will be fairly high on the list. So how can a grateful runner pay that blessing forward? There are several routes you can take. You can volunteer at a race. You can invite a friend to go running with you. You can help a running partner train to set a personal record. Or if you’re more globally minded, you can help to save the world. At least, that’s the idea a Lebanese industrial designer named Nadim Inaty proposed this summer to a website called Yanko Design, an online magazine dedicated to introducing innovative concepts in all walks of life. Inaty’s design was complete with specs and schematics, and the discussion that followed further clarified precisely how runners and cyclists can produce green energy and decrease our collective reliance on fossil fuels. Yes, it’s ambitious, but the whole notion is actually quite plausible. Here’s how the Yanko site describes it: “Green Wheel is an exercise machine that transforms kinetic energy produced by the human body into electricity. Multiple machines are connected to a central energy storage unit where electricity can then be supplemented to road lights and traffic lights.” Essentially, the machine is a large (3 meter diameter) hamster wheel that is powered by humans; it’s not the most flattering exercise invention ever created, but then again, neither is spandex. Inaty imagines that units could be placed in public spaces – his prototype features grassy rest areas surrounding the wheel - and that users could donate their jogging time in exchange for a place to run. Have you ever run along the coastline and wished the view could last forever? Well, if a Green Wheel was parked along the rec trail somewhere, you’d enjoy the same scenic vista throughout your entire run. At the very least, a unit would be a step up from the treadmill, which has been antagonizing runners ever since the days of George Jetson. If your health club installed a few Green Wheels alongside the regular treadmills, wouldn’t you rather pick the one that had some external benefit? Don’t worry, someone will figure out a way to show your favorite TV program inside the wheel by the time we get there. Health clubs can make an even more tangible impact if similar technology is incorporated into exercise bikes. Imagine a spin class full of energetic 30-somethings pumping their legs up and down like crazy, generating small increments of electricity with each pedal stroke. If nothing else, the power they create will offset all the hot water they’ll use when showering afterwards. For the concept to succeed, Green Wheels need to be used in large numbers, because the power output is somewhat low. By Inaty’s calculations, a single unit used for 30 minutes will produce roughly 120 watts – which is enough to light a compact fluorescent bulb for five hours, or to charge 12 mobile phones. Another necessary component is altruism, in that runners or cyclists will voluntarily contribute their efforts for the greater good – which is where the whole Thanksgiving thing comes back in. If you’ve been blessed with the ability to run, wouldn’t you appreciate a creative way to leverage that gift for a greater good? Or if you’re looking for a unique way to get in shape, would this kind of eco-friendly mission be enough to inspire you? The Earth needs your help. Get out there and run! The tenth presentation of the Big Sur Half Marathon on Monterey Bay is this Sunday. Last years race was tainted by the first and fifth place men’s finishers testing positive for banned performance enhancing drugs a few weeks after the race. Ezkyaz Sisay and Christian Hesch were asked to return their prize money but have not. In order to insure that this doesn’t happen again, the BSIM organization, according to Letsrun.com, is instituting drug testing of elite prize winners and masters prize winners to prevent paying any “cheaters”. If the elites ask for confirmation that there will be drug testing the organizers have assured us they will deny it. We applaud the BSIM for these procedures. It’s hard to find ways to improve the event, but there are a lot of new surprises for the “regular” runners as well this year. Michelob Ultra will be served again after the race, but the sponsors are also bringing some craft beers as well – Stella Artois and Shock Top. Nothing like a cold beer after a half marathon; that is, unless it’s chocolate milk! Troia Dairy Distributing in Monterey is providing this tasty treat for all runners. There has been a lot of research lately indicating that chocolate milk is the perfect recovery drink. More chocolate: Ghirardelli has stepped up to be a sponsor of the race for the first time so all the runners should look forward to that as well. The “VIP’s” and volunteers will be served Starbucks coffee, as they are on board as another new sponsor. Runners can benefit from a new series of race clinics that are given Saturday at the health and fitness expo at the Monterey Convention Center. Special topics are proper running form, Clif Bar pacing team presentations, an ultra distance running panel, tips for busy runners, and a panel of local experts providing advice on running the Big Sur Half Marathon course. We are honored to be on a few of the panels. Mike is providing advice on running the course at 11:45 on Saturday and Donald is on the Ultra Running panel at 2:30. 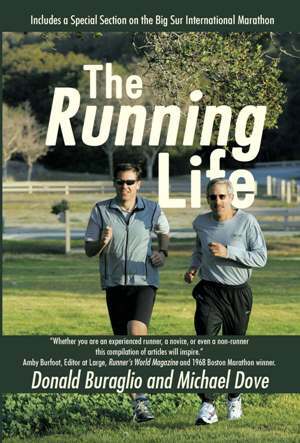 Our book, The Running Life, is also for sale at the Big Sur merchandise area for a special expo price of 20% off. If you buy one and find us we’ll be happy to sign it for you. All half marathon runners receive a special commemorative 10th year anniversary poster. Certainly this will become a collector’s item. Technology advances have made possible a new mobile app with maps, directions, places of interest, and a premium package allows runner tracking and live updates for a small fee. You can search iTunes or the Play Store for Big Sur Marathon or Big Sur Events. The new timing company, South Valley Endurance, will provide live web results and a finish line video. To accommodate a record of more than 9,000 half marathon runners, besides the Custom House garages (be there before 5:30AM), and Monterey Peninsula College parking lots for shuttles, a new parking location at Del Monte Center (more shuttles), has been added. Shuttles run until 6:30 AM. We recommend these rather than the runner drop off zone on Pacific Street near Monterey City Hall. We applaud the marathon staff of Chris Balog, Sally Smith, Julie Armstrong, and Susan Love for continually providing the best racing experience for all runners. Enjoy your taper and we’ll see you on Saturday and Sunday. Look at any list of the top sporting accomplishments of all time, and Roger Bannister’s 4-minute mile will be near the very top. It was the culmination of a quest that captivated the world, and an iconic moment that ultimately transcended sports. On a blustery spring day at Oxford University’s Iffley Road track, Bannister accomplished a feat that many observers considered physically impossible. On the 440-yard tracks of the day, the one-mile race and Bannister’s accomplishment had an especially elegant symmetry to it: four laps, one minute per lap. Races were timed by sweep-arm stopwatches, and a runner on four-minute pace would circle the track in perfect synchronicity with the second hand of the watch. The one-mile race lends itself to dramatic execution, much like a four-act play, or a symphony in four movements. A successful race requires a strong opening, a solid, thoughtful effort through the second lap, and perseverance and determination through the third. The final lap then builds upon these with a final crescendo toward the suspenseful – sometimes tragic, sometimes inspirational - conclusion. Through the 1970s, United States high school and college runners raced the mile on 440-yard tracks, but with the advent of 400-meter ovals, most of them now race the 1600m. (Only one state, Massachusetts, has never officially converted to metric races.) This distance is roughly 99.4% of a mile, falling short by only 7 yards – but it’s also something of an odd distance, lacking the symmetry or cultural resonance of the classic one-mile race. It may not be coincidence that interest in track has diminished since the mile was phased out over the past 30 years – but a runner named Ryan Lamppa has started a grassroots effort to “Bring Back the Mile”. Ryan is a Harvard grad and a founding director of the Running USA organization, and his goal is to “return the mile to prominence on the American sports and cultural landscape.” His goal is to create a national movement, and it’s one that is rapidly gaining momentum in the track community. The list of supporters and organizations endorsing the campaign is a who’s who in the running and sports world; Sports Illustrated magazine, the Associated Press, Los Angeles Times, Running Times magazine, Road Runner’s Club of America,Letsrun.com, as well as many of America’s best former distance runners including Jim Ryun, Don Bowden, and Marty Liquori. The website www.bringbackthemile.com has mile news, state federation petitions, history, athlete snapshots, all time record lists, and the “I AM THE MILE” engagement page. They’re also reaching out through social media to spread the enthusiasm for reviving this classic event. Ryan is from California and is petitioning the California Interscholastic Federation (CIF) to replace the 1600m with the mile in high school meets. We’re pulling for him to succeed, and we’d love to start watching one-mile races during the spring track season. In the meantime, we’ll be wearing our “I AM THE MILE” shirts and doing as much as we can to support his efforts. The University of Michigan Hospital’s recently published results from the annual National Poll on Children’s Health indicates that for the first time ever adults view “not enough exercise” as the biggest health concern for children in their communities. Number two on the list is the related category “Childhood Obesity”. Numbers three through 10 on the list are: smoking and tobacco use, drug abuse, bullying, stress, alcohol abuse, teen pregnancy, internet safety, and child abuse and neglect. Dr. Matthew Davis, director of the poll says, “exercise offers many more benefits other than weight loss or preventing obesity, such as better attention and learning in school and improved sense of well being.” We’ll go one step further and say that children’s exercising on a regular basis improves self esteem, body awareness, appreciation for their own health and contributes to lowering the possibility of a child getting involved in ALL of the items in the health concern list. Most experts agree that it is the joint responsibility of the parents and the schools to promote an active lifestyle among children. How do you effectively teach your children the value of regular physical activity? Most schools, unfortunately, have budget shortfalls, no Physical Education teachers, and lack of resources to meet their state mandated guidelines of 200 minutes of P.E. time every two weeks for each student. There are competing priorities for school and teacher time and some school administrators feel that inside time is more valuable than outside time. The Big Sur International Marathon’s JUST RUN program is a FREE program available to all schools in Monterey County. The program has won so many local and national accolades and educational awards that it is being used by schools in 14 states and 2 foreign countries that have found the program on the internet (www.justrun.org) and registered. The program can be implemented by any teacher or any parent in any school; they do not have to be a P.E. specialist. It can be implemented during, before, or after school. Research studies on JUST RUN schools in Monterey County indicate that the percentage of students passing the aerobic capacity California Fitnessgram test increase from 56% to 81% when schools implement JUST RUN. As well, there are associated increases in the other five Fitnessgram measured areas. Even more significant, academic testing scores have increased 2% to 11% in schools adapting the JUST RUN program. Assessment of children in the program and parents indicate participants are not only getting fitter, but are enjoying the program; 98% of the kids want to do it again the following school year. JUST RUN also has an associtated nutritional component aptly called JUST TASTE and a good citizenship program called JUST DEEDS. Forty six of Monterey County’s approximately 110 schools are doing the JUST RUN program. If you are a parent of a child in one of the 64 that are not, you can call the Principal and help get one started. Contact JUST RUN program administrator Susan Love at 831-625-6226 or susanwlove@sbcglobal.net for more information.